Do you know about orgonite for energy clearing? Go to my Orgonite page. Soul Sounds is an enchanting sound therapy CD that brings you into a guaranteed deep relaxation and meditation. A sound bath of harmonious sound tracks and waves helps you to quickly reach inner harmony. Soul Sounds is the result of fifteen years of experience with a collection of the finest, hand picked singing bowls. Dirk originally learned how to use the singing bowls from the Hungarian shaman, Joska Soos. 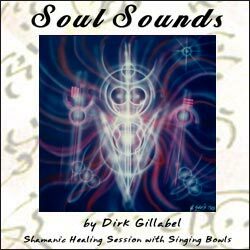 If you are into sound healing, or clearing energies with sound, you might want to buy my Soul Sounds CD. The session was recorded using professional recording equipment that could handle both the very low and very high sounds produced by the singing bowls. These sounds have a profound impact on energy body of living beings, but also on the environment in general. For those unfamiliar with singing bowls: this is not music. However, the sounds are soft and harmonious. It starts calmly and builds up gradually. The primary purpose is deep relaxation allowing you to come into contact with your inner self. The sounds also have a profound effect on the subtle bodies, and on the environment in which they (or the CD) are played. I love to hear from you. How did you react to the sounds of the singing bowls sounds? What effect did they have on other people around you? I first encountered the singing bowls on a magical tour of Southern England with friends. Passing through Glastonbury, they visited the ruins of the abbey. There, in front of the legendary tomb of King Arthur, a young man was making strange sounds with two shining metal bowls. One of my companions explained that these were singing bowls. She said she knew Joska Soos, a Hungarian born shaman living in Antwerp who used these bowls in healing sessions that he called “shamanizations”. Later I visited Joska Soos for a shamanization. I was so intrigued by the singing bowls that I decided to buy two of them, a choice I would never regret. During the following year I played these bowls every evening, which resulted in an opening up of my character. I experienced first hand what a profound effect the bowls have on the physical, psychological and spiritual level. Over the years I acquired more singing bowls, using them for group sessions in a meditative and healing way. My aim is to help people benefit from this natural and mystical way of healing. Deep relaxation to unwind that stress we all build up in our daily lives. Because singing bowls create a garden of tranquility. Meditation practices: the sounds of the singing bowls entrain the brain waves to go quickly into meditative states. Healing work: singing bowls enhance healing in massage therapies, Reiki sessions, regressions, emotional release, and other healing techniques. Singing bowls work strongly on the chakras. Clearing: It is my own personal experience that the sounds of the singing bowls clear a room from negative energies, and they create a peaceful environment. Energy work: the singing bowls create the right energetic atmosphere for ceremonies, celebrations and rituals when working with Nature and Cosmos. Background music: singing bowls are very relaxing during daily routines, when doing physical or yoga exercises, breathing exercises or chakra work. I received my CD and began to play it. The changes in my house’s energy and now mine are very noticeable. Thank you so much. Hi Dirk, I’m Cees Bonhof from Holland, and I just want to let you know I enjoyed reading your book(s) about singing bowls. It’s always nice to know there are more players who are down to earth as regards the origin(s) and qualities of singing bowls so I read your book with great pleasure. Hi Dirk! I am Jasmyne. I have just recently begun using the singing bowls music during meditation. It has been ….?.. indescribable! I have been meditating for a few years, and I have used many different techniques to quiet my mind. Never before have I been able to slip into my practice so effortlessly! They are truly magical! I cannot thank you enough for this priceless download. Since discovering this amazing music, I have spent quite some time looking in stores and online for recordings. They are certainly not easy to find ( especially for one as technologically inept as me!). I was working with a 10 minute track that I found on you-tube and just replaying it, but then I stumbled upon your page and WOW! Your art is just beautiful! So, I thank-you again for this amazing gift! I just received your cd.. its really beautiful. I just received your cd, and it’s amazing how fast it arrived. Thank you very much. Just finished listening to it now and it is very powerful. Hi Dirk, I received my C.D. ok today and thank you, It is beautiful, so calming and centering.